Preservation is an important component of any archival program. It is one of a number of activities that archivists undertake to ensure that records of enduring value will be accessible long into the future. It can also be a very tricky activity given the multiple formats that archives are required to maintain: everything from paper documents to photographs, negatives, slides, scrapbooks, ephemera, newspaper clippings, audiovisual materials on a variety of media, and in some cases artifacts of every shape and size and material. 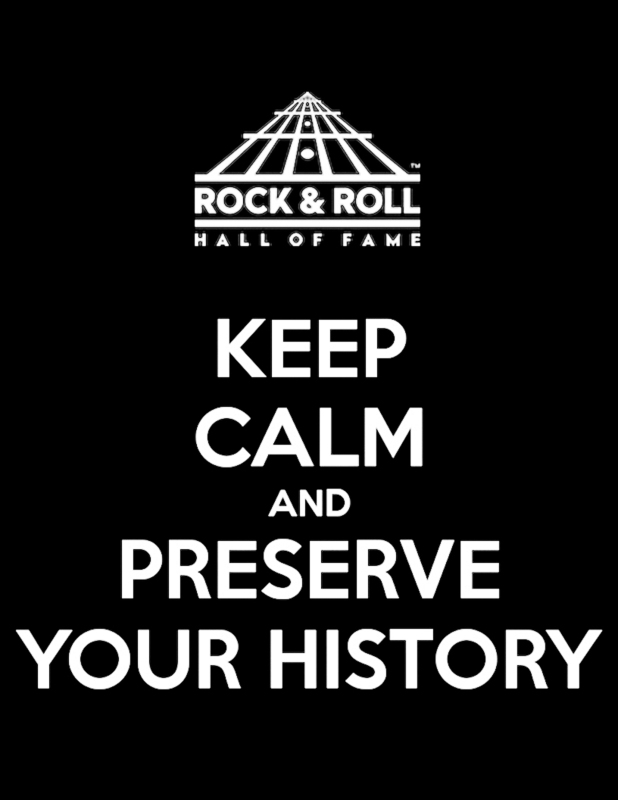 The archivists at the Library and Archives of the Rock and Roll Hall of Fame oversee the care, description, and access of the audiovisual and paper-based materials in the Museum’s permanent collection. We have a supply budget that allows us to purchase chemically stable, acid-free enclosures and a conservation lab that provides us with the space and materials to clean collections and create archivally-sound enclosures of our own when necessary. Zine created by the NEO Sound crew to give you a handy printable version of the information included here! The Hippocratic Oath, borrowed from medical professionals to first consider whether a prescribed treatment will harm or heal a patient, has long been a mantra of conservators of historical materials as well. Acknowledging that in the past conservation treatments and preservation practices were undertaken that were thought to help historical materials but actually harmed them in the long run, present thinking is that it is much better to retain the original look and feel of an object and to not undertake any procedure that cannot later be undone. This is why laminating, for instance, is no longer a recommended practice for brittle materials. The adhesive, plastics, and heat applied during the laminating process all work against paper materials, causing more rapid deterioration. It is much better to simply place brittle items in stiff mylar sleeves, from which they can be easily removed at a later date, if it is determined the mylar is more harmful than helpful. So always keep in mind, when reading or viewing recommendations for preserving your family collections, that your goal, first and foremost, is to do no harm and that sometimes certain types of work are beyond our skills and require the work of a professional conservator. Everyone has mementos or keepsakes that they hold onto throughout the years; items that are precious and document life, love, interests, and passions. First, decide what you want to save long-term. You can choose to preserve final versions of documents, or you can include drafts and revisions. Clearly label and date materials so you will have that information later on. Use pencil; if you must use ink, label the file or plastic sleeve housing the item instead of the item itself. Avoid letting your personal collections get scattered or misidentified. The following are some suggestions to help you preserve your “records of enduring value.” However, the most important thing to remember in preservation is that these items deteriorate no matter what you do, but if you can manage use, light, pollution, and high fluctuations in temperature and humidity, you will prolong the life of the materials. Handle photographs with gloves or hold them at the edges. Use a soft brush to wipe away dirt. Do not store items in attics or basements, or near kitchen or bathrooms. Use a dehumidifier in damp areas. Storage should be in a cool, dark, dry, stable environment. A stable environment makes all the difference; rapid fluctuations in temperature and humidity do the most damage. Place items in containers--like filing cabinets, boxes, and folders--to protect from dust, dirt and light. Dust and dirt can abrade surfaces and attract mold and insects. Light fades, discolors, and makes paper brittle. This damage is permanent and irreversible. Use folders instead of envelopes to reduce damaging the edges and corners of documents and photographs. If using plastic preservation supplies, look for chemically stable plastics with the terms "polypropylene," "polyethylene," and "Melinex." Unfold and flatten papers and photographs. If a photograph or document is fragile, enclose it in an archival plastic sleeve (i.e., 2-3 sides of the enclosure are left open). Never encapsulate or laminate anything in plastic (i.e., do not allow the enclosure to be completely sealed shut). ​Before storing, remove photographs from mats and mounts, if it is possible to do so without damage. Store color and black-and-white photographs separately. Store black-and-white prints and negatives in buffered folders (8.5 pH). If framing, use archival supplies; look for the terms "acid-free," "lignin-free," and "buffered." Framed works should not be in direct sources of natural or fluorescent light, and don't leave materials "on display" long-term as they will become damaged over time from environmental exposure. Never use “magnetic storage albums.” If you must mount photographs, use acid-free paper and corners; never use glue or tape. Keep highly acidic items, like newsprint or documents printed on older recycled paper, away from other materials. To preserve this content long-term, photocopy them onto acid-free and lignin-free paper. If the information contained on an audio or video recording is important (e.g., a family history), a paper-based transcript should be made of the content. Most importantly, be careful to protect yourself! If there is any mold, spread out the items in a well-ventilated area away from living areas and let them dry. Brush off the mold when dry. Always wear a mask; if you are particularly susceptible to mold, also wear other forms of protective clothing (e.g., eyewear, apron, gloves). The more often you are exposed to mold, the more likely you are to have a bad reaction, so always be safe! Remember also that sometimes an item can be too badly damaged to save, or is so badly damaged that a professional conservator needs to be involved. For assistance, visit the American Institute for Conservation's Find a Conservator website or the Northeast Document Conservation Center's Conservation Services for Private and Family Collections. Alpena County Library shows simple techniques in safe-keeping and preserving family papers, letters, photographs, textiles, and books. Learn what "archival quality" means in regards to the products used to protect your treasured Items and where to find them. This Friends of the Library workshop at the UCLA Chicano Studies Research Center (CSRC) covered basic archival principles for preserving family photographs. Participants learned the basics of arranging, describing, storing, and digitizing photographs for long-term preservation. Make sure your zipcode is entered into worldcat.org, and it will tell you what library closest to you has these resources to help you organize and preserve your family collections! Here are a few vendors through which you can obtain the types of enclosures discussed in this post. Please note that inclusion in this list does not constitute endorsement of the vendor by the Rock and Roll Hall of Fame and Museum or its Library and Archives.